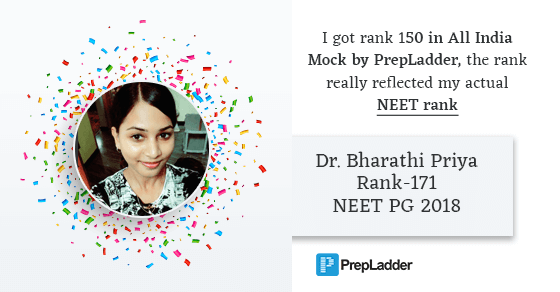 PrepLadder congratulates Dr. Bharathi Priya on securing Rank-171 in NEET PG’18. WE wish her all the best for her career and future ahead. In this exclusive interview with PrepLadder, she shares the plan that worked best for her to help you achieve your dream PG seat. I'm Dr. Bharathi Priya from Thanjavur Medical College. I secured AIR 171 in NEET-PG 2018. What do you think is the correct approach to study for NEET PG? Only MCQ's or Theory+ MCQ's? I prefer theory during initial 5 months plus subject wise tests if you have time. Mocks for last 1 or 2 months . Don’t just do book back MCQs .Write tests. That will show your performance. As early as possible. But if you are from busy hospitals, then start immediately after completing internship. Listen to online lectures or live classes and take notes. You can easily cover all important topics and that's enough for NEET. Yes, I attempted NEET PG 2017 during my internship and scored AIR 34,000. The exam was full of one liners. I had no time during internship. So, I didn't concentrate on studies. NEET 2018 pattern was different. More concept based questions. So concepts are more important. Never mug conceptual subjects like physiology and medicine. Revision is essential. But it depends upon you. Some prefer 3 revisions before exam. But if it’s your first attempt one revision is enough and do twice for your toughest subjects. Yes, I wrote All India Mock by PrepLadder before NEET and got rank 150. The rank really reflected my actual NEET rank. Long term plans usually don't go well. I used weekly plans. Make short timetable daily or weekly. But don’t study haphazardly without proper idea. I scored good marks during MBBS. Don’t lose hope by comparing yourself to others. Put your 100% effort. Start from the very First day. What was your strategy to tackle negative marking? How many questions did you attempt? I was quite worried about the negative marking but attempting mocks helped me to gain confidence. I have attempted 278 questions, Right - 216, Wrong - 62. You can leave upto 25 questions not more than that. If you are really confident then go for 290 questions. Give mock tests, assess your performance and negative status.Then decide. 1) Everyone will have depression during preparation and even during exam. So never feel down till the last minute of the timer. 5) Start writing full tests ASAP. No need to finish all subjects. I started giving full test from the 1st month of preparation so that I can visualize my improvement. 6) Never trust last 2 months .Try to finish maximum portions 2 months prior to exams.